This is pretty much the foundation of all longboard dancing. It’s the trick you should learn before you do anything else if dancing is your thing. 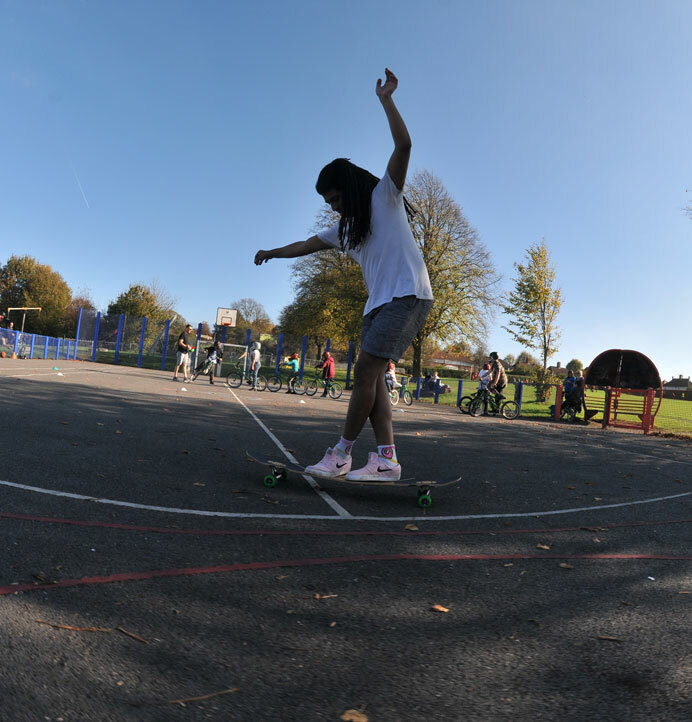 Longboard surfers will be familiar with the cross step too – it’s the most basic bit of footwork that you can do to get your weight forward to trim your board for straight line speed. 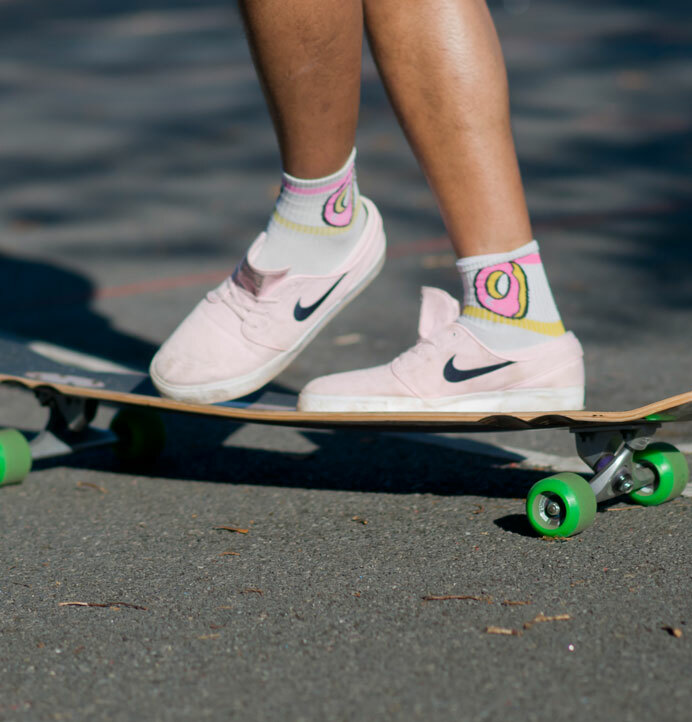 If you’re a surfer and you want to brush up on your footwork – learning on a longboard skateboard will make life WAY easier next time you’re in the water! As longboard tricks go, the cross-step is pretty easy to learn, and the risk of injury is low. If you’re just starting out, give it a try whilst holding onto a handrail or something first. In terms of terrain – all you need is a flat bit of road or pavement. You need a bit of space, so an empty car park or similar is perfect for learning to dance in. 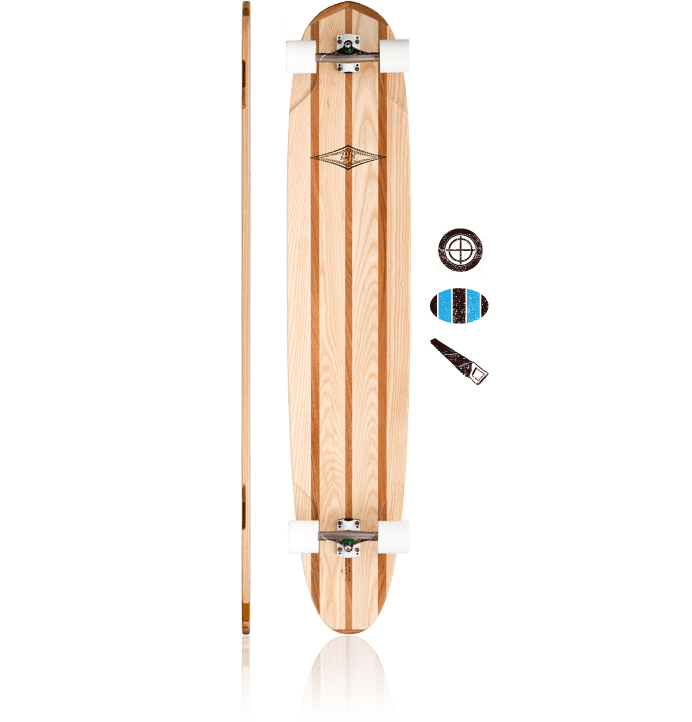 For gear, a longer longboard is essential. 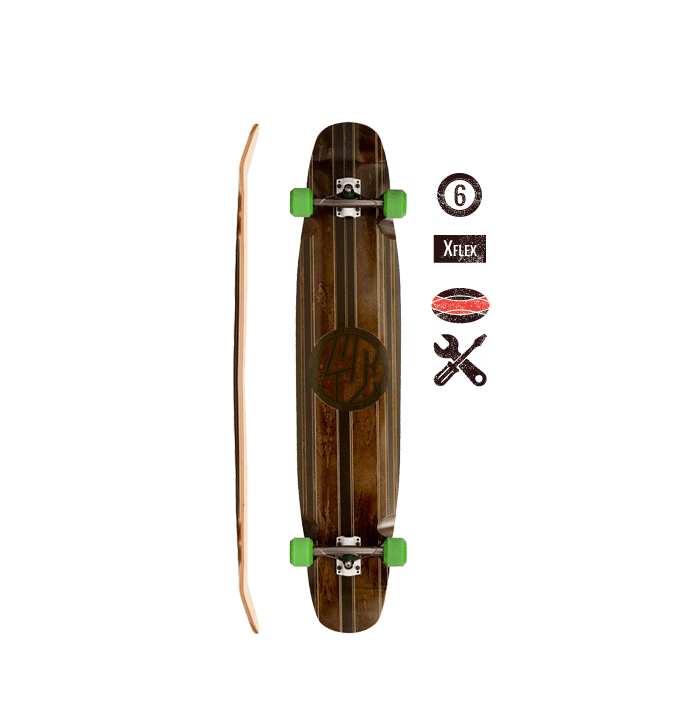 You want to be skating something at least 44″ long to give yourself room to play with. Bigger boards make this easier as you can be wider with you stance. 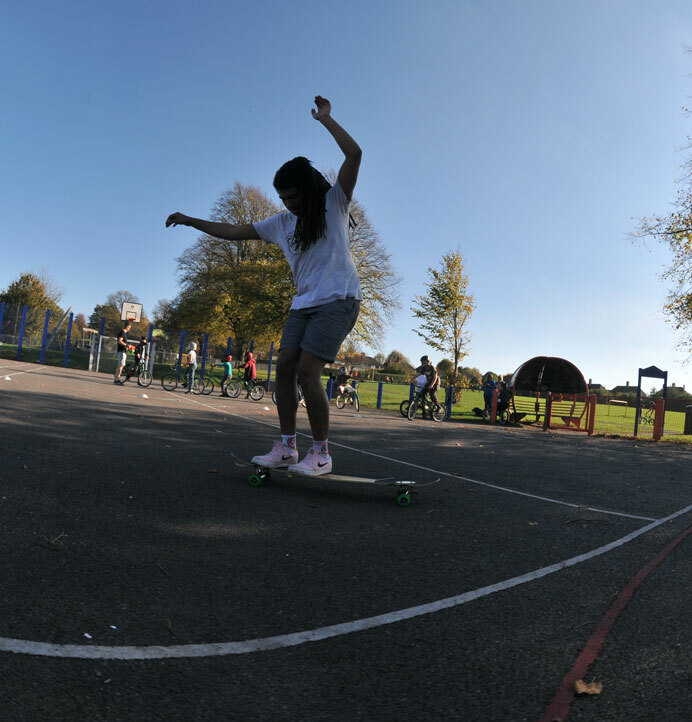 A symmetrical board isn’t required at this stage, but could come in handy later as you start to do 180 slides and shuvits. A helmet is a good idea, and maybe wrist guards, but more pads than this will just slow you down and stiffen you up. It’s important to be fluid and flexible whilst longboard dnacing, so just try not to fall off and put up with the odd graze now and then! Get rolling along at a decent speed – ideally a little more than walking pace. 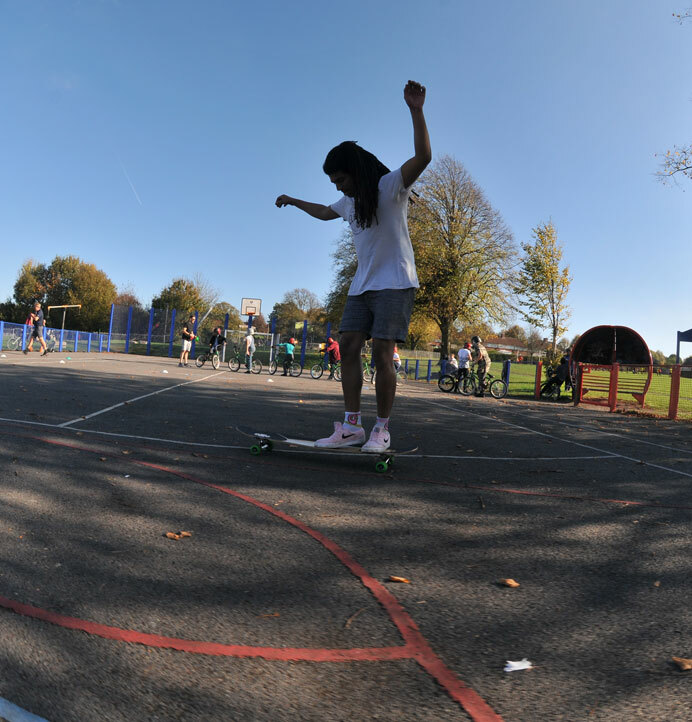 Cross-stepping can actually be harder at very low speeds – you want a bit of momentum in the board for stability, just the same as you do when you’re riding a bicycle. 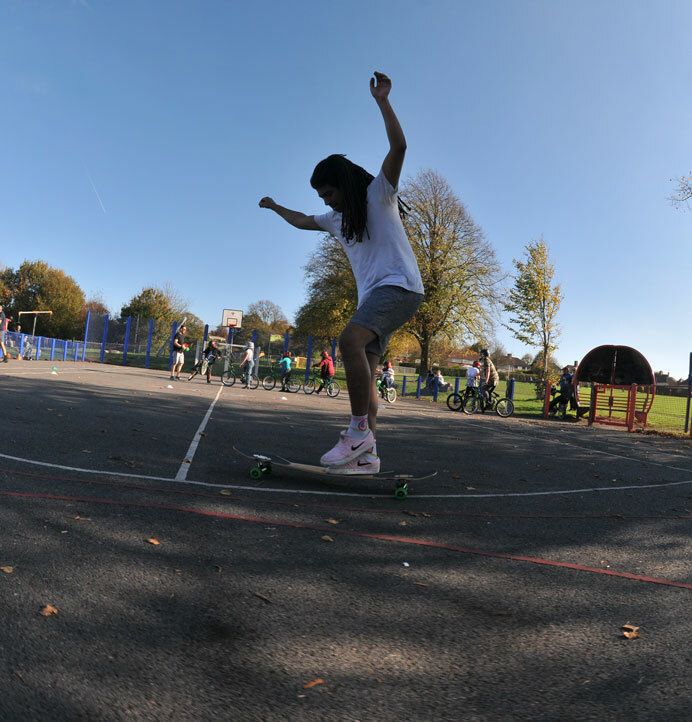 Feet can be far apart in your normal skating position. Move off your front foot back up towards the tail, tightening your stance up. Use your arms to balance. You’ll find that your arms wave around all over the place to start with – once you have this mastered, you’ll find you can do all the balancing you need with your body. Start to lift your back foot off the board and shift your weight forward, slowly and smoothly. Take your time and keep it smooth! Now is the harder bit. Move your weight onto your “new front” foot, and swing your back foot around behind it to find the nose of the board. Keep it smooth and unhurried, and use your arms to balance. The reason this is a bit wierd is, for a breif moment, you are skating with all your weight on the “wrong” foot – what is normally your back foot, or the foot that you push with. You’re probably pretty good at skating whilst balanced on your front foot, as you need to do this to push the board along. But skating on your back foot, even for just a moment, is going to be a bit odd the first time you try it. Skating comfortably and confidently on either foot is the key to a lot of longboard footwork, so it’s really worth taking your time to learn. At this point, just try to hold out the second part of this cross step for a while – get used to the feeling of skating on the back foot until it’s not weird anymore. You’ll find that you’ll get used to it very quickly, and as soon as you do, a lot of cross-stepping tricks will become a LOT easier. If you push mongo (with the front foot), then you might find that it’s the first part of the cross-step that you struggle with. 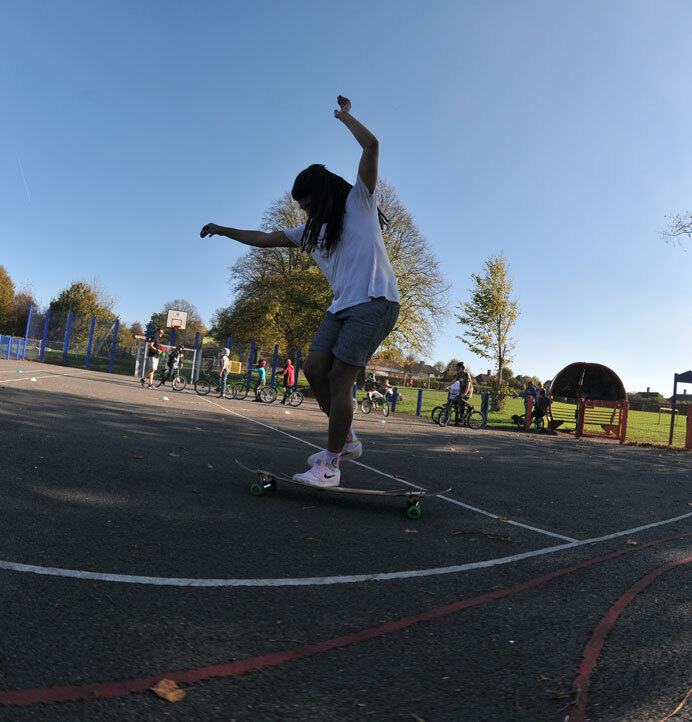 Skating whilst balanced on the “wrong” foot has a lot in common with skating switch or fakie. Practise makes perfect! Now you’re up here – enjoy it! The most important thing is – take your time and keep it smooth. Hurried, jerky movements are what cause you to fall off. Once you’ve figured out where your feet need to be, try to train yourself to not look down when you’re skating. Looking at your feet all the time makes it harder to balance, you are more likely to skate into things, and… well… it just doesn’t look cool. On the other hand, you don’t want to step right off the nose of your board! 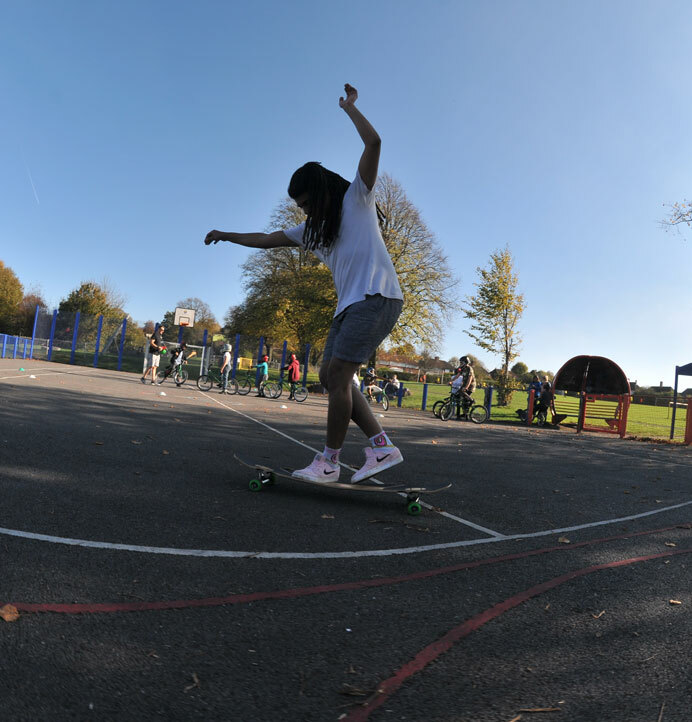 You’ll get a feel for cross-stepping without looking down the more you try it by feeling your board under you. Speed is important to keeping things smooth. Once you have mastered the foot and body position, push faster and try to be as smooth with your movements as you can. You’ll get a feel for it surprisingly quickly! If your board is long enough, you might now be at the nose yet. Do another cross step and get up there! The obvious thing to do on the nose is a nose-wheelie. This takes a bit of practise – but it’s super fun once you get it! Cross-step backwards (“backpedal”). This is a bit harder than cross-stepping up the board, but keep at it and you’ll get there. Just reverse the steps forward until you’re on the tail. Prison Walk. Essentially, once you get to the nose, turn around and walk back down to the tail, then turn around again. This is a bit harder than the backpedal step, as you’ll be facing and walking in the opposite direction to your direction of travel. You should also have spinners down before you do this. 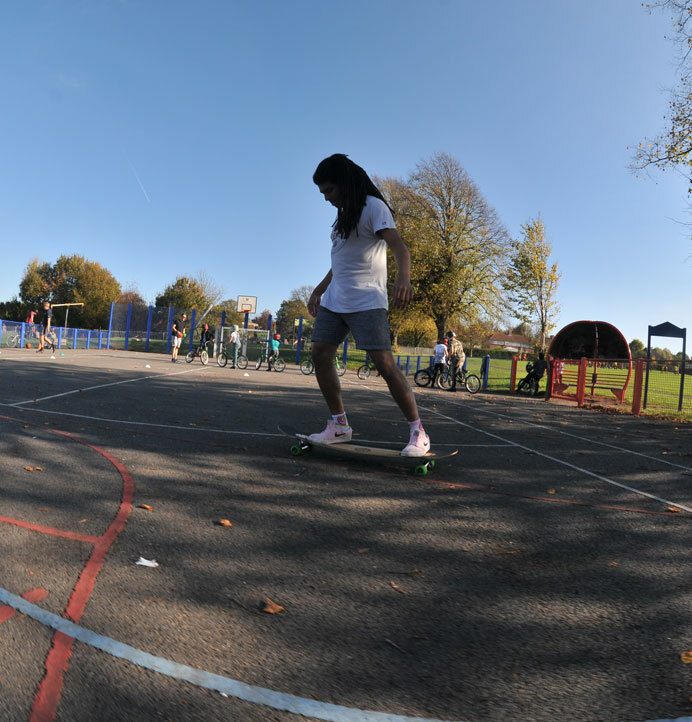 Do a Shuvit to get the board around underneath you. From the nose, you are perfectly positioned to just do a shuvit and you’ll end up on the tail! You’ll really benefit from a symmetrical board to do this. 180 standup slide off the nose. A little bit easier than a shuvit, just throw a 180 slide from the nose of the board to bring the tail back round in front of you and hey presto – you’re on the “tail!” Similar to a Shuvit, this will be a lot easier on a symmetrical board. 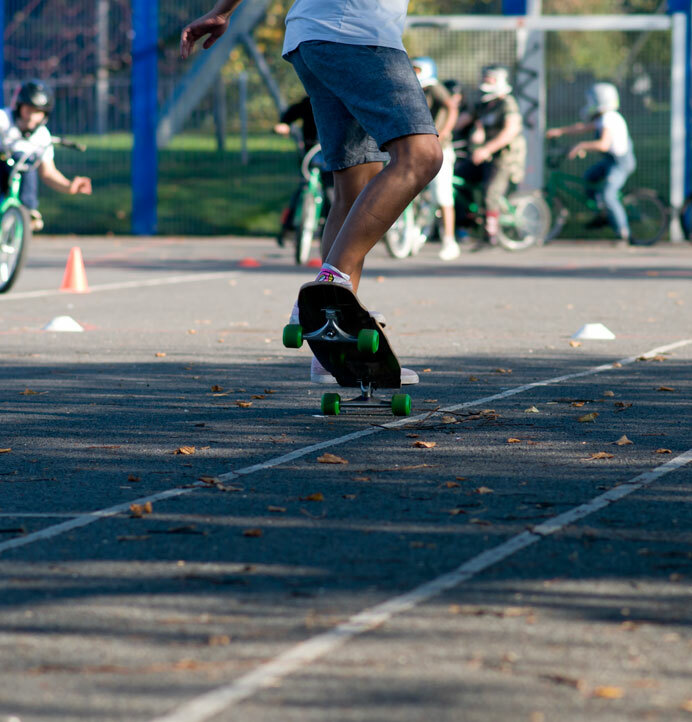 Be sure to check out our other longboarding trick tips!